Thousands of Chabad "shluchim" came to the Rebbe's home in Brooklyn for the annual get-together. Photos & video. About 5,000 Chabad "shluchim," or emissaries, came to the Lubavitcher Rebbe's home in Brooklyn Sunday for their annual get-together. The emissaries serve Jewish communities all over the world, bringing Jewish religious services, holiday celebrations and Torah learning to Jews who would otherwise have a hard time reaching them. They do this at great personal sacrifice, their children studying by internet groups and often managing with few or no friends and their houses always open to any Jewish travellers who need a kosher meal and hospitality. The Chabad seders are known to backpackers in places as different as Katmandu and Oxford. Young Israeli travellers count on Chabad to be there for them just about anywhere in the world. 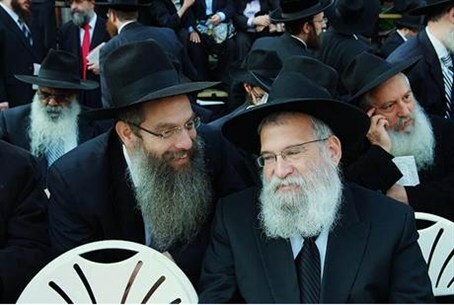 The most famous Chabad emissaries are, tragically, Rabbi Gavriel and Rivka Holzberg, who ran the Chabad House in Mumbai, India. They were brutally murdered by Islamist terrorists in November 2008 along with four other Jews who were in the Chabad House and only their young son survived.